Channel 4 launched 4oD at the end of 2006. 4oD, standing for 4 On Demand, is Channel 4’s catch-up TV service. With 4oD, you can watch recent Channel 4, E4 and More 4 programmes over the Internet. Much of Channel 4’s back-catalogue of TV shows is also available over 4oD. You can watch via a web browser on your computer, or on a TV set with some digital TV providers. 4oD is available on a Windows PC, Mac or Linux device. You don’t need to install any special software, although you will need to have Adobe’s Flash Player installed. BT Vision lets you watch over 40 TV channels, and also offers hundreds of hours of on-demand content over Broadband. 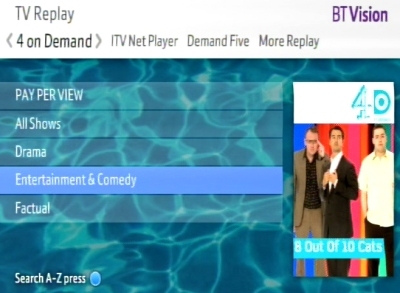 BT Vision lets you access 4oD on your TV, as well as catch-up TV from BBC, ITV and Five. Virgin offers content from 4oD on your TV over their cable TV network. To get Virgin Media, you need to live in a Virgin Media coverage area. TalkTalk TV (formerly Tiscali TV) offers live TV via an aerial, and other TV services over a phone line. Tiscali carries content from Channel 4 4oD. To get TalkTalk TV, you need to live in a TalkTalk TV coverage area – you can check at talktalk.co.uk/tv. 4pD from Channel 4 – The official BBC iPlayer site. thanks for the article. For those who live outside UK and want to access 4OD you can use UnoTelly as I do to get around the geo block.